we have a problem with switching basemaps in our Android app. We have two different types of basemaps (both are ArcGISTiledMapServiceLayers, based on MapServices published to our ArcGIS Server). However, the user can toggle a switch to change to the other basemap. Sometimes this works without problems, especially if we only just started the app. But if we then, for example, press the home button and thus pause the map, reopen it, and try to switch the basemap, nothing happens - the basemap we try to remove remains visible. Sometimes, we can see a few single tiles of the second basemap "shining through" , but that's all. to save the map state in onPause(), and map.restoreState(mapState) in onResume ? By the way, the same problem appears if we don't use "removeLayer" and "addLayer" but instead setVisibility(true/false). Any ideas how to solve the problems? Thank you! "Saves the coordinates of the center of the map, the current map resolution, and the LocationDisplayManager state"
This should not affect the layers that are showing. 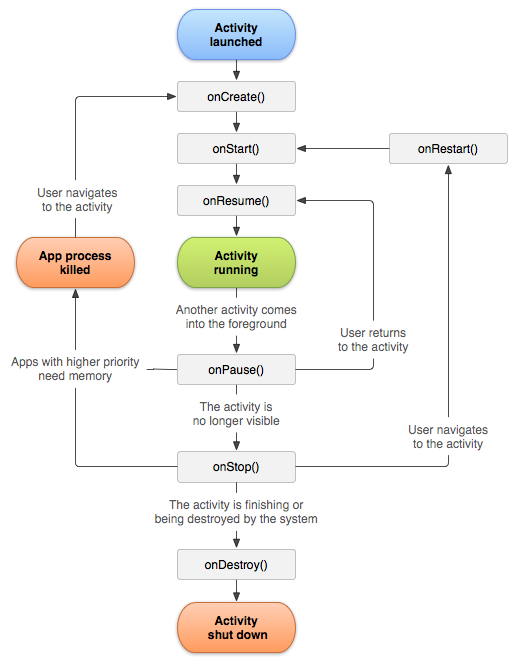 Is there a chance that an app with a higher priority that needs memory is recycling your app and you are going back to the onCreate method or is it possible that your app is hitting onRestart and then onStart since the activity may no longer be visible? We just checked it again, but the problem indeed mostly happens after "onResume" is called, not after "onStart" or "onCreate". It happens even if there is still a lot of free memory available and no other apps are open. That seems odd. Can you send me the smallest reproducible sample so I may test here in house and update you with the results I see? Okay, I have written a small example application that shows one of our basemaps, and if you click on the button, it switches to the other basemap. Again, this works well until I press the home button. If I then reopen the app (which was not destroyed, just paused), I can no longer switch basemaps. It only contains one activity, "BasemapActivity". If for some reason you cannot compile the app from the source code I provided, please let me know and I can send you a signed APK file. I am in the process of downloading the file as we speak. I will update you as available. I am in training the next two days so it may be a little difficult to find the time to test this. Great!! This solved our problem.